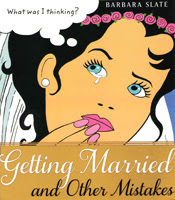 It can be argued that those who can retain a sense of humor in the face of heartbreak and disillusionment get through it better than most, and Barbara Slate demonstrates just that in her graphic novel, Getting Married and Other Mistakes. Slate’s book is filled with moments many women will be able to identify with. Her protagonist, Jo, is devastated when her marriage suddenly disintegrates, and somewhat surprised that her ensuing depression doesn’t seem to have anything to do with missing her soon-to-be ex-husband. What follows is an affecting journey of self-discovery in which she tries to face herself honestly and find her true voice. The dissolution of her marriage leaves Jo with plenty of time for introspection, and she uses it well. Looking back over her life, she soon discerns a pattern of self-repression, much of which can be traced straight back to her manipulative mother whose primary goal for her daughter was landing the right man. Jo wonders, “Did I get married to make my mother happy?..to make her proud?...to finally shut her up?” These questions lead to many more, and eventually send Jo on a search for her own voice, which she had learned to ignore for so long. Remembering one of her first disappointments involving a man in her life, Jo recalls the intense hurt, but also remembers how she instinctively downplayed her feelings, even with her best friend: “I knew if I ever showed them, then I could never take them back. I would be fully exposed…my naked self…out there for the universe to gobble up.” In this respect, Jo is very much us (haven't we all had moments where we've held back our true feelings, pasted on a smile, and pretended that whatever we were crushed by doesn't really matter at all? ), and Barbara Slate has created a character that readers will almost instantly identify with and root for. Slate’s effective prose is enhanced by her illustrations, which are primarily bright and vibrant with the exception of those panels depicting Jo’s memories, which are rendered in grays and whites with an occasional splash of red. The device could have been too obvious, but here it works, with the stark grays serving to emphasize the loneliness in Jo’s memories and the poor decisions she made in the name of “being a good girl,” even as the bright splashes of color in the panels highlight her spark of life that survived it all. While the subject matter in Getting Married and Other Mistakes may be a rather sober one, Slate’s humor shines through in every panel, softening the edges of what might otherwise seem bleak and depressing through her own witty voice and apparent ability to see the proverbial silver linings. Graphic novelist Slate’s list of credits is truly too large and impressive to fully list here. She’s created cartoons and illustrations for Mattel, DC Comics, Cosmopolitan magazine and more, she’s authored a book called You Can Do A Graphic Novel which, along with a companion Teacher Guide, is used to teach teens how to create their own graphic novels, and she also lectures and teaches workshops. Getting Married and Other Mistakes is both witty and poignant, and those who mistakenly pass it by on the assumption that graphic novel = comic book will be missing out on a great and often illuminating reading experience. Highly recommended. Getting ready to publish your book? your business or personal publication? for accurate and affordable proofreading services!